Buried 100 feet underground in northern Italy, about 30 miles from Turin, rests a subterranean marvel known as the "The Damanhur Temples of Humankind." It's the second stop on "Good Morning America's" Magical Mystery Tour. 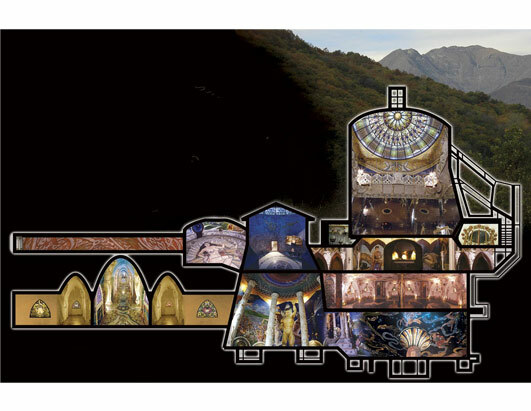 This image superimposes a map of the temple on top of the Italian mountainside where it sits. The project, which was begun in 1978, is the idea of a self-proclaimed "visionary" named Oberto Airaudiwho, a retired insurance broker who goes by the name Falco. He says the temples are the re-creations of "visions" of elaborate halls, or temples, he experienced as a child. Z, I've added a numerology gadget on this blog now - top right. Have fun !